Photo courtesy of L.L. Bean. I came upon this parka in an odd way. My previous warm weather coat was stolen from my car, in winter. After fifteen years of use, my coat was gone! My old coat was an L.L. Bean coat and I was very happy with it. L.L. Bean has a number of coats that fit this bill and after about thirty minutes of perusing their on-line catalog, I settled on the “Baxter State Parka.” It looked to have everything I wanted and Bean had a $30.00 off sale at the time, so it cost me $169.00. I do astronomy and find myself out in the cold a lot, standing still and trying desperately to not move as I look into a telescope. This is exactly the way to get cold fast. My old jacket used to keep me warm most of the time. Since I was getting a new jacket, I decided to get a warm one. Boy was I surprised. Putting this thing on is like getting into a warm electric blanket and turning up the heat! It is truly a warm parka. Let's look at the features list one at a time. The hood is comfortable and seems windproof, so far. I have not been in anything stronger than about 15 to 20 MPH winds, but the only real indication there is wind is the Faux-Fur ruff blows in my face a bit. One good point, if you meet one of those dye-toting hippies and he/she/it starts looking at the fur ruff with pure hatred, you can whip out your L.L. Bean catalog and prove to them that no animal was molested in the making of your FAUX FUR ruff. 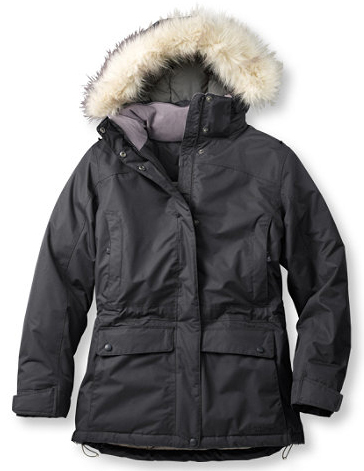 The fur ruff can be unzipped from the hood and stowed in one of the parka's many pockets. The hood can be unzipped and stowed. The hood is secured with a Velcro connection at the lower connection points of each end and there is also a zipper across the lower rear to make it wind proof. The hood has a Velcro rear adjustment which allows you to shorten the length along the vertical axis of the hood, thus pulling the fur ruff back from your eyes. This allows you see those PETA girls better, a very handy feature if you live in the Pacific Northwest! My old coat had a string tightener across the waist. This parka has two. One on each side, just where your hands would hang, making it simple to tighten the waist. My old coat had Velcro wrist tighteners and this coat also has them. I am not a fan of Velcro, because after a few years it picks-up every loose piece of lint near it. It does take time to gather enough lint and such to start bothering me, but my old coat had its share of “stuff” in the Velcro. This parka is warm. It is rated as +5 to -45 Deg F by L.L. Bean. Bean calls the +5F rating the standing rating. If you are motionless in minus five degree weather, you should stay warm. Bean calls the -45 rating the moving rating, if you are jogging in -45F weather, you should stay warm. Based on my use so far, I would NOT want to be jogging (unless I am running from one of those dye toting hippies) in this parka. It is really warm! Wearing it in 30 degree F weather, I really can't tell it is cold outside, nor am I too warm. One drawback is that the parka does not have a removable lining, or if it does I can't figure out how to remove it. If I ever need that feature, I will fondly think of my old Bean coat and the person now wearing it, while I fondle my .45. When you put it on, as your arms slip into the sleeves, you can feel the lining lightly grip your arms. This does not make it difficult to put on, it just feels nice and warm. Oh yes, that lining you can't remove is 650-goose down filled. WOW, my old coat did not have that! The feel of the parka while wearing it is very nice and when you move it makes a soft sound, sort of like stepping on fresh snow. I really like goose down filling. Bean uses something called TEK-2. That is a Bean owned trademark, so who knows what it is. The official description used in the legal documents describing the TEK-2 trademark reads as follows: "Fabrics treated with a combination of shell materials, coating materials and laminate materials that increase the breathability, water-resistant and moisture-wicking properties of the fabrics, sold as components of apparel." I have not been able to really test the parka in the rain for long periods of time. I did test it by standing in the rain for about 7 minutes. I never got wet and the neighbor across the street still has no idea what I was doing just standing in the rain. I assume it is at least as waterproof as my old coat, which would never let me get wet inside. The new parka does not feel heavy, but it is a bit heaver than my old coat. I estimate it weighs about four pounds. It has inside pockets, outside pockets and a few others. Their locations will be left as an exercise for the reader to locate. The one thing I do not like is the cut of the main hand pockets. My old coat had them cut at a 45-degree angle; this coat has 90-degree pockets that put my hands in a slightly awkward position. I bought gloves, as well, so this is no big deal. I like this parka. It is warm, very comfortable, keeps me dry, does not weigh too much and has a pile of neat features. I would buy it again. Alas, it is not my old coat, but it is very close. One thing about the L.L. Bean warranty, it is solid. After 14 years, the zipper of my old coat busted. I figured I was going to have to get a new coat. I looked at the Bean website and was amazed to see one of those "cover everything" warranty statements. I called them and asked if my old coat was covered. It was. I sent it in; they fixed it, and were a pleasure to deal with the entire time. About two weeks later, my coat was returned with the zipper fixed and, of all things, they cleaned the fuzz off of the Velcro! The treatment I got, on a fourteen year old coat, floored me. That is why I bought another L.L. Bean product. Copyright 2012 by Dave Cole and/or chuckhawks.com. All rights reserved.